The same great award winning sounds you know and love from our flagship Pads line, now in MainStage. The perfect way to play Worship Tutorials Pads in your church. Our MainStage Pads Player patches aren’t software patches that you play with a keyboard. They are the exact same Pads samples available from our Flagship Pads line that you know and love. We’ve simply optimized the files to play inside of MainStage. This allows you or your keys player to play any instrument patch you’d like within MainStage while playing the Pads as well with control over the volume level and transparency of the Pads (more on that in a bit). The exact same Pads sounds you know and love, built right into MainStage. All 12 keys. Each of the Pads Player MainStage patches contains Pads in all 12 keys – just like the regular Pads products. Crossfading. When you change Pads, they crossfade automatically. Turn them off and they fade out. All done under the hood in MainStage. Pads sounds are included with the patch – you do not need to purchase the Pads mp3 files separately. Transparency Knob: Turn the knob up and the Pads take up less sonic space. Turn it down and they get bigger. Two great instruments built in. You can use any instrument patch you want with our Pads Player patch, but we’ve included two great sounding instruments for you to get you started. Separate volume control for Pads and each instrument layer. Delay and Reverb control for each instrument. The MainStage Pads Player patches allow you to trigger Pads with the push of a button (or a key on a keyboard depending on how you map the patch). It just becomes part of your keys player’s setup and workflow. And it puts control in the hands of musicians. You can use an iOS device or app to trigger Pads, or you can implement them into your presentation software, but all these solutions have potential limitations. MainStage overcomes all these limitations. 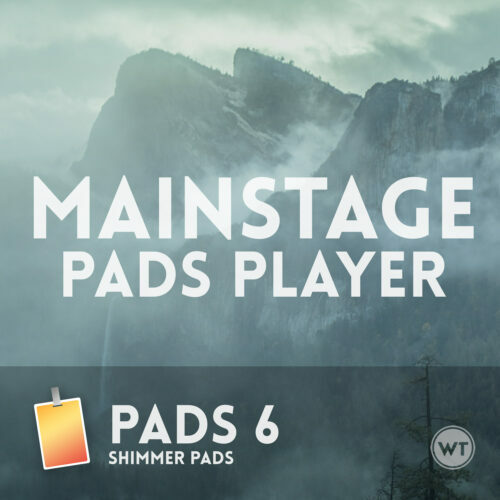 With our MainStage Pads Player patches, anytime you trigger a new Pad, the Pad that is currently playing fades out while the new one fades in. This is all handled within MainStage itself, and it works seamlessly. You can easily switch keys smoothly between songs, or even within a song to facilitate a key change. When you stop the Pads, they fade out as well. We’ve noticed (and we’ve heard from you), that sometimes the Pads can take up a bit too much space. You can always just turn them down, but this does not really solve the problem of EQ space. We’ve added a knob called ‘TRANSPARENCY‘. As you turn this knob up, the Pads take up less pace. It’s extremely effective if you want to remove some weight from the Pads and have them take up a smaller sonic footprint. Then, when you want the Pads to sound bigger, just turn the knob back down. Does this mean I can play your Pads as an instrument? Kind of. The Pads are still audio samples that play back when you trigger them – they’re not software patches that you play with a keyboard. But you can control how they sound using the Transparency and EQ knobs. Do I need to purchase Pads sets to use with these patches? No, you don’t need to purchase anything else to use the MainStage Pads Player patches. All the audio files are included. How is this different than the regular Pads sets? Besides the fact that it’s a MainStage patch rather than just an mp3 file, these patches provide an enormous amount of flexibility compared to Pads if you’re already using MainStage. What if I already have Pads, is there a benefit to having these patches? We think so, and we use both the Pads mp3 files and these MainStage patches all the time in our worship services. Having Pads connected to a MainStage rig on your stage is extremely beneficial, but there are times where you may want to play them from your production booth or a mobile device. Having both the regular Pads sets and the MainStage patches allows you to utilize Pads in a wide variety of situations. Visit the Pads page to learn more about Pads and how they can transform y0ur worship services. How do I download the patch? When you purchase the patch, you’ll get an email with download link. You’ll get a link to a large (200+ mb) .zip file that contains the MainStage patch. You can also log into your account on the My Account page and download any downloadable products that you’ve purchased. What if I have trouble downloading the files using the links provided? If you have purchased the patch but are having problems downloading them, please send me an email and let us know. We’ll get back to you ASAP with some other download options. What kind of hardware do I need? You’ll need a computer capable of hosting MainStage (and a way to get the audio into your sound system), and that’s about it. From there you can use any kind of midi controller you’d like to trigger the Pads and play other MainStage instruments. *please be patient when downloading these files, downloading may take some time.